Is It Safe to Hunt in Mexico? Thirty years ago American hunters freely crossed the border to hunt for big deer in Mexico. Just across the Rio Grande from Laredo, Texas, American hunters had huge leases, and on those ranches they grew and shot trophy whitetails, notably huge, wide-racked 10- and 12-point typicals. Farther west, Americans crossed at Nogales, Arizona or flew into Hermosillo to hunt the state of Sonora for giant desert mule deer, and Coues whitetails in the mountains. From the 1970s through the 1990s, Mexico was a deer hunter’s paradise: Cheap to travel there, lease land, stay in a hacienda on a ranch for a few weeks each January (when the weather is perfect and the bucks rut) and shoot big deer. Then came the drug wars and violent crime that we see and hear about to this day. Now, nobody in his right mind would try to cross the border with rifles at Laredo or any other checkpoint in South Texas. Chances are you’d end up in a Mexican jail like U.S. Marine Sgt. Andrew Tahmooressi, who has been held for more than 120 days after he mistakenly crossed into Mexico with guns. And even if you did make it into northeastern Mexico where the whitetail hunting used to be so fabulous, you’d be taking your life into your own hands. I hunt in South Texas a lot, just miles from Mexico, and I have friends and acquaintances in various law enforcement and border agencies down there. “Fifty-fifty whether you’d get out of there alive,” one guy told me. “You couldn’t pay me a million dollars to go down there,” said another police officer. These guys have offered to show me pictures of mutilated bodies, decapitations and the like, but I have declined. I do not exaggerate. No wonder the number of American whitetail hunters is basically zero in Mexico now. What about farther west, out in Sonora south of Arizona? I hunted there 20 years ago and loved it, and I killed a good Coues buck. Is it safe to hunt there now? Surely there are drugs and cartels there too, but how bad? I had to think about all that last January, when out of the blue I got the opportunity to hunt Coues in Sonora again. I called my buddies in Texas law enforcement. They said the situation was better there, but still risky and unpredictable. “Travel at your own risk, and here’s the number of a guy if you get in a jam,” one officer said. Not too comforting, but not too bad, the world is a dangerous place. I chewed on it for a while, and I went. In January, I flew into Hermosillo and immediately ran a snag. To enter Mexico with a gun you get a permit from the Secretary of National Defense. You work with your outfitter in Mexico who works with the government to get the paperwork right. Rule #1, that rifle permit needs to be in order, and you need to keep it on your person at all times. At customs, a nice senorita surrounded by soldiers in fatigues and holding what looked to be full-auto rifles opened my rifle case, checked the papers and found a discrepancy. A signature was in the wrong place from the little Spanish I could gather. They were about turn me around and send me back to the states (or worse) when my liaison, Jorge, showed up and haggled with the authorities for an hour in a flurry of Spanish that I would never understand. Ultimately I was ushered through customs and away we went for camp. Lesson #2: Every outfitter in Mexico has a liaison to meet and greet you at the airport and ferry you to and from your camp. Get to know your man well, treat him right and do not let him out of your sight while you’re still in the city and on the road to and from camp. Give him a crisp $100 bill up front to take care of you. The delay at the airport cost us. We had a grueling 5-hour drive out to the remote ranchlands where I’d hunt, and 2 hours in it got dark. Rule #3: Never drive yourself in Mexico—your liaison drives–and don’t travel after dark, even with your front man driving. Around midnight, still a good 2 hours from camp, we popped over a hill and our Jeep was suddenly blinded by enormous spotlights. Vehicles roared out of the darkness, two mounted with machine guns, and in a plume of dust blocked the road. Twenty men on foot with long guns surrounded the vehicle. “Soldiers,” Jorge said casually as he rolled down his window. I froze and wondered if that was good or bad. Jorge talked with the two leaders for 10 minutes and I deciphered “Americanos” and “para venado” (here to hunt for deer). They waved us through. No money changed hands on the spot, but I got the distinct impression arrangements had been made. I wondered what that meant for me, and my wallet. We made it to camp and things were fantastic. The hacienda was charming and comfortable, and the very authentic and gourmet Mexican food was the best I’d ever eaten (the Carne Asada was to die for). For 5 days I hunted tens of thousands of remote, unique, beautiful high desert acres with no other hunters within 100 miles. On a clear day you could look across the vast shimmering desert and see all the way to the Gulf of California. I had some great companions (picture above, left to right: Jesus, Miguel, me and Roger Cook, an Arizona hunter who’d come down to help me out and translate. We hiked 5-7 miles a day, sat on hilltops and glassed for the elusive and little gray deer. We grilled burritos over an open flame for lunch, and then lay in the sunny desert for afternoon siesta. We saw some deer and a few bucks, but not as many we should have. Since fewer American hunters have been coming to Mexico in recent years, the money has dried up. Many outfitters and ranch managers have not been able to maintain improvements on their ranches, most notably not putting in water tanks. Deer have to have water in this arid world; there was a lack of it on the ground we hunted, thus not that many deer. Rule #4: If you decide to go to Sonora, check with your outfitter and make sure the ranches you’ll hunt have adequate water. I did see several mule deer in the lower elevations (the Coues stay high and the muleys low), including 2 bucks that would go 170 or so. “No grande,” Miquel had said. Not big enough, though I was not cleared to shoot a muley anyway (read I had not spent enough money, as Coues are much cheaper to hunt than the coveted desert mule deer). One good thing about fewer Americans hunting Mexico is that the bucks have not been shot; they have aged to 5, 6,7 years and older. There are some slammer mule deer bucks in Sonora right now, 180 inches to 200-plus, some with magical 30-inch-wide racks. That is what I’d go back there to hunt if I had the money ($10,000). You’ll have to wait until the TV show airs later this fall to see if I shot a Coues buck or not, and how big. Do not even think about crossing the border into Mexico from El Paso east to Laredo to Brownsville, where the whitetail hunting was once so fine. 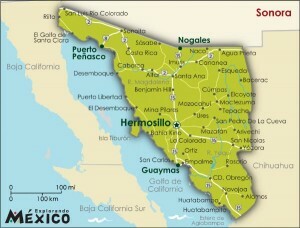 I might travel to Sonora again, maybe, with the understanding that the trip would not be without risk. Remember rules #1 and 2: Have your gun permit in order, and do not let your Mexican liaison out of sight when you’re in the cities and on the road driving to your hunting ranch. Once I arrived at the ranch and was out in the sunny desert chasing deer, I felt safe and comfortable, but never let your guard down. Remember rule #3: Do NOT travel anywhere in Mexico at night. Plan your travel to arrive and depart Sonora in daytime only, whether driving down from Arizona or flying through Hermosillo. Good luck if you ever go, it really is a unique and fun place to hunt once in your life. Maybe I’ll see you down there one January…or maybe not. Anybody ever hunted deer in Mexico before? Would you ever go now or say to hell with it, just isn’t worth it? This entry was posted in BigDeer, Hunting News, Sportsman Channel by admin. Bookmark the permalink. !No salir de los Estados Unidos para ir a cazar ciervos mi amigo!! Es mas dangerosa!!!! Me no go south of the border, either, Amigo! Mike back in 1986 I hunted doves and whitetails in northeast Mexico on a ranch named LaQueza or at least that is how it sounded to me. They had several water tanks and small stock ponds where we set up for pass shooting the doves. I shot doves or should say I shot over 3000 rounds of 20 ga. shells at doves in 4 days! I also killed a 158″ whitetail that weighed about 115 pounds at 5 years of age small body big antlers when he laid at my feet I rough scored him over 170″ as I was not used to such small bodies combed with large racks. Anyway I felt safe traveling from Texas to the ranch thru customs with the ranch manager then. But I wouldn’t do it today as I’m told several different parties of dove hunters were beaten and robbed of shotguns, wallets, even wedding bands by ” Mexican Army and Police” as a matter of fact the booking agent I used at the time was one of those that was fleeced and beaten. Never been to Mexico, never want to go. Call me a sissy, but I enjoy breathing. Hunted in Canada twice now and that was a big enough hassle. The Canadians were complete jerks at the border going up and then the Americans decided to completely rip our truck apart on the way home because they received a “tip” that some American hunters were trying to sneak drugs back across the border. Of course they found nothing and sent us on our way. Only delayed us 4 hours. Never hunted in Mexico but I know plenty of people who did. Note, I said did. Not a soul in his right mind (Sorry Mike) would go down there to hunt or do anything else. I used to go all the time, at least twice a year to big game fish out of Cabo San Lucus, Puerta Vallarta, and Acapulco (fantastic sailfishing). No more. I know it’s supposed to be safe in the resort areas but to me it’s still a No bueno. R, it really is a little better from what I saw over in Sonora, and that is not even a tourist/resort place. But believe me I hear you brother it’s no doubt risky everywhere u go down there.! My thoughts of hunting big deer are with snow and cold temps. 300 lb chocolate racks in sask. Until they stop the illegal folks coming in the US- both adults and children, the entire US needs to boycot visiting, buying, or supporting anything and anyone in Mexico in what was once a great place to visit and hunt. A buddy and I actually hitch hiked from Laredo to Monterrey in 1964 with no problems. Get Tahmoorissi out of jail. We as Americans can cause the Mexican gov. to address all the “Situations” there- our illustrious leadership obviously can not. Call me one of the real dumb gringos I guess. Have friends who own a fantastic 7,000 acre ranch named Rancho Los Apaches in Coahuila roughly 40 miles NW of Laredo right along the Rio Grande which we have hunted for the last ten years. There are great quality rifles with Leupold and Zeiss optics available at the ranch so it is not necessary to go thru the hassle of temporary importation of firearms. I make the drive from Houston to Los Apaches in roughly 6-7 hours. We drive ourselves to the ranch on the way in – we cross over using the Colombia Bridge for several reasons, mainly because it keeps us from having to drive thru the city of Nuevo Laredo – but the owners will meet hunters on the US side of the border and drive ahead of you to the ranch if requested. You don’t have to worry about obtaining licenses or doing the paperwork to bring your trophy and cape back across the border – it is all taken care of for you. There is the occasional issue with the Agricultural inspection and interpretation of the rules regarding the freezing and treatment of the capes, I have had a cape confiscated due to the presence of one dead tick on the hide. Honestly, it is the only issue I have ever encountered while hunting at Los Apaches. To date we have never experienced anything remotely approaching a threatening or unsafe incident. We time our arrival in Laredo to eat an early lunch, then we cross over and make the drive to Los Apaches in time to select a rifle, fire some practice rounds and make an afternoon hunt. 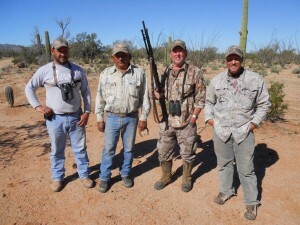 The ranch owners are very proud of the property, their staff and the quality of the hunting experience at Los Apaches. They are present during your hunt, dine and socialize with you. When we enter the ranch and the gates are closed we never leave the property until the day of departure. The routine for departing the ranch is a morning hunt if required, lunch and being on the road by no later than 1:30pm. On the return trip to the US, the owner who also manages the property drives ahead of us to the US point of entry and leaves us once we reach the Agricultural Inspection area. So to take it from the top, we do not have to worry about Rule 1 regarding bringing in rifles. Even though we drive ourselves, the ranch owner is usually in front of us on the drive to the ranch and always leads us out on departure day, we never leave the property during the hunt, the owner / manager and the staff who reside on the ranch are always present so we address Mike’s Lessons 2&3. The ranch owners have great contacts with the Mexican police and military in the area and stay abreast of any real or potential problems related to drug or gang violence, are active members of the ANGADI community, reside on the US side in Laredo so they make the trip back and forth to the ranch on almost a daily basis during the off season, have excellent contacts / relationships on the US side, and can be depended on to let us know if they think it is not safe to make the trip to hunt.